This feature allows the user to specify whether canceled and closed orders should be exported separately from regular changes when exporting order audit data. To support this, a new flag has been added to the EDI Profile Maintenance screen. This is accessed from the Special Functions menu within Customer File Maintenance. 77. Export Order Audit for Canceled/Closed Orders – The default value is “Y.” If the flag is set to “N,” then during Order Audit Export, the application will verify when the order header has been closed or canceled. If true, the records will not be exported through the Regular Order Audit Export. 78. Canceled/Closed Orders Export File Path/Name - This field allows the user to define the name of the export file when running the new Canceled/Closed Order Audit Export. The menu option COP-> Util-Setup-> Sales Order Export-> Export-> Order Audit Data Export has been divided into two menu options- Regular Order Audit Export and Canceled Order Audit Export. Both of these applications support the same user interface. The only difference is the file path and name based on trading partner profile. The screen title indicates which mode the user is running. Field 11. Export Filename and Path will default to the new option 78. Canceled/Closed Orders Export File Path/Name in EDI Profile Maintenance when running the Canceled/Closed version of the application. 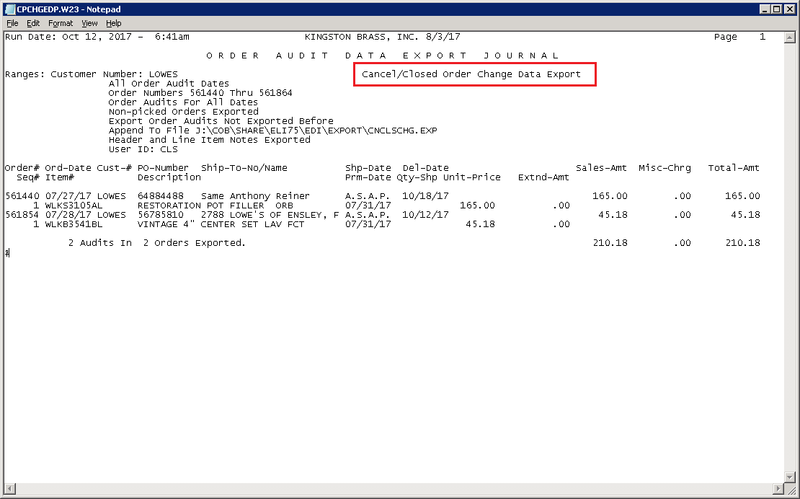 Running the Canceled/Closed Order Change Data Export will only export orders that are canceled or closed. 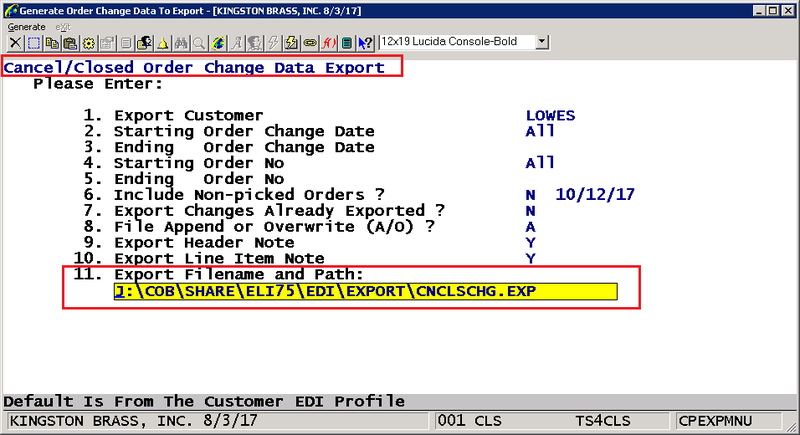 Running the Regular Order Change Data Export will verify which option the user has set up in field 77 of the EDI profile for the customer. 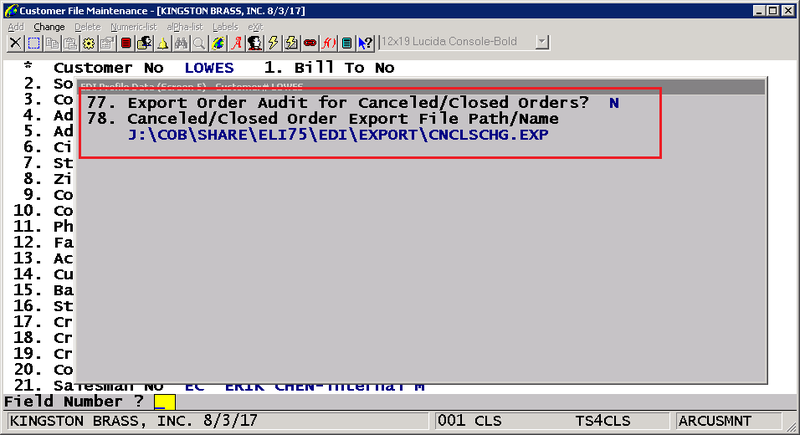 If Export Order Audit for Canceled/Closed Orders is set to Y, all data will be exported including canceled/closed orders. 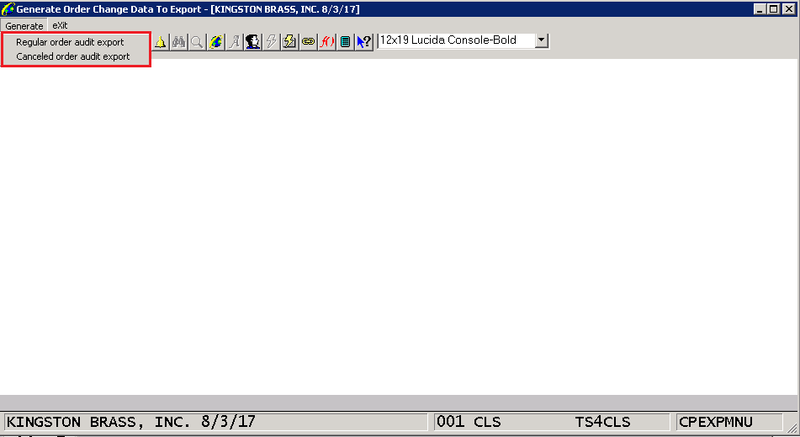 If the flag is set to N, only information for orders that are not canceled or closed will print. A new legend area has been add the the export report indicating which mode was chosen when the report was run. This feature also includes the ability to automatically export the order audit information when an order is canceled or closed. If the customer's EDI profile is set to require that an 865 document is generated, the user will be prompted to export the information immediately when the order is canceled or closed.